Numbered white crosshairs (red center pixel for Soviet, blue for American) correspond to list below. Place your cursor on a particular geographic feature to get more info about it. The color scale bar on the left indicates altitude (blue/purple = lowest, light gray/white = highest, yellow = datum). The "Forward, On to Mars!" chapter in our Russians in Space CD-ROM begins with the phrase, "The legendary reluctance of the planet Mars to give up its secrets...". That legend, which continues to this day, has a strong basis in fact as you can see below. Isn't it curious that missions to Venus, a much harsher environment, have been much more successful? On December 4, 2000, NASA announced that layered, sedimentary deposits have been identified by the MGS at northeastern rim of Hellas Basin, the chasms of the Valles Marineris, within impact craters of Western Arabia Terra, and the inter-crater plains of northern Terra Meridiani. These new findings support theories for the presence of large amounts of liquid water on the surface of Mars for the millions of years necessary to create these deposits. Given that life emerged on Earth almost immediately after the Hadean era (a 200-300 million year period of massive bombardment approx 4 billion years ago), it would seem that life, at least simple life, is an ubiquitous process in the universe. Thus, the chancethat Mars too, had life at some point in its past has just dramatically increased. Return to Mars topo map. Aside: Something else to think about: It would seem, prior to the putative arrival of Mars Polar Lander wreckage on the south pole, that the Americans and the Soviets, like medieval popes and monarchs before them, had divided an entire world amongst themselves into two hemispheres of exploration. For all the American landers prior to now have touched down in the northern hemisphere, all the Soviet ones in the southern. Granted the data set on which this speculation is based is rather small. In late May 1999, NASA's Jet Propulsion Lab released the impressive mapping results from Mars Global Surveyor to the press, coincident with the publication of an article in Science. I have modified JPL's false-color topographic map to reflect a more intuitive layout (IMHO; granted the former layout was more compact). The false color scale off to the left shows the corresponding elevation. The datum, defined as 0 km, is light yellow-green. According to the most recent results from MGS, there was probably an ancient northern ocean corresponding to the medium/dark blue contour, fed by channels off Tharsis and from Valles Marineris coursing thru Chryse. The prime meridian runs straight down the center of all three sections of the map. (It would seem that the cartographers selected tiny Crater Airy, 5 degrees south of the equator in the middle of Sinus Meridiani for Ground Zero. Well, everyone has to start somewhere. Perhaps a descendant of Lord Airy's sat on the naming committee. According to Spaceflight Now, the prime meridian was first defined by the German astronomers W. Beer and J. H. Madler in 1830-32.) The equator runs from left to right across the rectangular portion, which extends to the 70th parallels north and south. It is over 21,300 km wide at the equator; but only about one third that, 7300 km, at the 70th parallels due to the unavoidable distortion when rendering a spherical map onto a flat surface. Imagine curling the central part into a ring so the left and right edges meet. Then fold over the two ends, capping the tube so all the coordinates line up. Topologically, you have a cylinder masquerading as a sphere. Each tick mark on the scale around the rectangular portion equals 5 degrees latitude or longitude. Note how the latitudinal ticks stretch farther from the equator to compensate for distortion. Meanwhile, the north and south polar projections also extend to the 70th parallels. The top and bottom circular sections have a diameter of 2400 km. The gray circle at the south pole is an image artifact.Return to Mars topo map. For reference, the Martian moon Phobos is in a 5836 km × 6117 km × 1.1 ° orbit, while the other moon Deimos is in a 20108 km × 20146 km × 2 ° orbit. Hellas Planitia (the deep violet-blue circle centered at 45 S x 70, which was originally misnamed "plain", but is now known to be an impact basin) dominates the topography of Mars, even more so than the Tharsis Bulge (the gray and white areas near the equator from 230° to 270°). Note the raised annular feature roughly 10,000-12,000 km in diameter surrounding Hellas. This is just the debris thrown out from the truly awesome impact, probably visible across the solar system. See the analysis below. The famous Valles Marineris, the canyon system which would stretch across the continental United States, is almost lost in this image (it's the light blue horizontal streak from 260° to 320° at the equator). The northern walls of Hellas appear to be almost vertical - imagine what the view would be like from a sheer cliff 7-9 km high! The floor of the basin is by far the deepest place on the planet's surface. There is a much wider, yet much shallower basin called Utopia Planitia in the northern hemisphere centered about 45 ° North by 120 ° East - the lip approaches the northwest slope of Elysium Mons. Return to Mars topo map. Something has resurfaced the entire northern hemisphere Vastitas Borealis recently (only 2-3 billion years ago instead of 4 billion), as it almost completely lacks large craters like the rest of Mars or significant mountains like the Tharsis bulge or Elysium. Utopia Planitia and Isidis Planitia are the two major exceptions. The Northern Waste may actually be an impact basin (but some planetary scientists think not* - see next paragraph), subsequently refilled with lava like the lunar maria, as it is smoother and on average 4 km lower than the rest of Mars. Thus, the entire southern hemisphere may just be the ejecta blanket from the massive boreal impact. If so, Mar's inventory of volatiles (C, H, N) may have been largely cooked off into space. The planet's axis of rotation probably shifted to where it is now as a result of the mass redistribution, much like the asteroid 2 Vesta reoriented its axis to center its big impact basin. *According to a recent lecture given at NASA's Goddard Space Flight Center, planets tend to form first crusts predominantly in one hemisphere. Mars is frozen with most of the high lands in the southern hemisphere and a great basin in the northern hemisphere. This is probably the original configuration although the poles may have drifted. The Earth also shows this property with most of the continental crust now in the Northern hemisphere and this polar distribution being much more common through geologic history than a uniform distribution. Why crusts would tend to form on one side only isn't clear: early in geologic history, a planet's rotation rate is relatively rapid and it has a dense atmosphere due to volcanic outgassing. These factors would tend to iron out differences in insolation and emissivity of various sorts of magma. 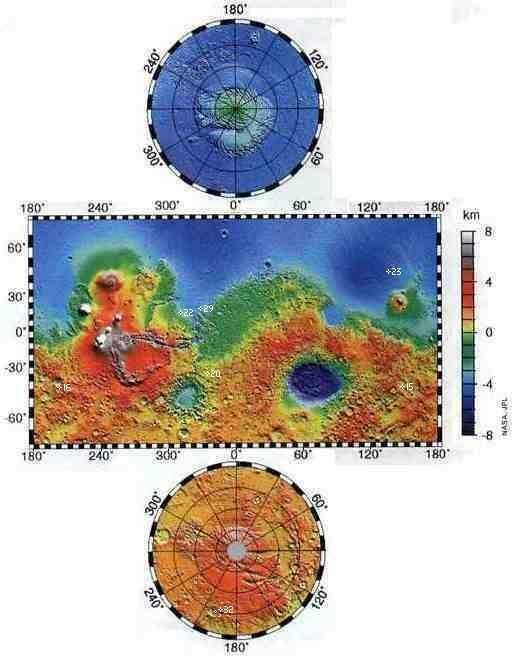 Do plates tend to congregate?Return to Mars topo map. Argyre Planitia (another misnomer) is about 4 km shallower than Hellas Basin, even though they appear comparable on a gray scale flat map. There seems to have been another Argyre-sized basin between the two, but it has been nearly erased by subsequent bombardment. The Tharsis Bulge is bounded on the north by Alba Patera (which is a plateau, not a shield volcano like the others), the Chryse lowlands on the east, the Valles Marineris canyon complex on the south, and on the west by the biggest volcano in the Solar System, Olympus Mons. The true height of Olympus Mons and the other Tharsis shield volcanoes ( Ascraeus, Pavonis, and Arsia Mons) is not fully displayed by the scale bar at left. They all top 27 km above the datum (however that datum has certainly been readjusted in light of the new laser altimeter readings). Why all the same height, even though the diameters are different? Probably because 27 km is the structural limit of the local basaltic rocks in martian gravity. At that point, they can't get any higher, they just spread out plastically. Return to Mars topo map. If Mars had about 100 times as much water as it seems to in this image, then the boundaries of its oceans and seas would correspond to the blue contours you see. According to the research just released last week, Mars did have an ocean up north with as much as 1 km of water in it. Such a depth would correspond to the contour between the dark and light blue areas. If Mars were fully terraformed, the northern hemisphere would have a cool, wet marine climate; the southern hemisphere would be cold, dry and alpine. Except for Hellas, which might actually get warm at the bottom. The southern climate is more extreme than the northern because Mar's orbital eccentricity, which is greater than Earth's, acts in phase with its axial tilt, which is also greater. (On Earth, they are not only out of phase, but climate is moderated by the thermal inertia of huge reservoirs of liquid water, i.e., oceans.) In Mar's boreal region, water freezes. But during austral winter, the air itself freezes. The south polar cap of dry ice (frozen CO2) extends almost to 60 degrees latitude, while the northern cap is much less variable. There are impressive canyons at both poles. Nevertheless, don't be too impressed by this seemingly rugged terrain - if Mars were the size of a billiard ball, it would still be almost as smooth. Actually, one way to grasp the scale of the landforms on Mars in relation to the whole planet is to imagine a large orange - the surface variation of its pebbled rind is about one percent of the radius of the fruit itself.Return to Mars topo map. The rumor of an alien Face on Mars has been debunked by imagery from the Mars Global Surveyor.. The revised description of the Hellas impact basin in the Southern Hemisphere impelled me to do some of those back o' the envelope calculations which I so dearly love. NASA said that Hellas basin is 2100 km diameter and 9 km deep. (The entire state of Alaska could be dropped into it with lots of room to spare; the summit of Mt. Denali would still be ~3 km below the crater rim.) NASA also reported that the ejecta blanket is 2 km thick at the crater's rim, and extends out 4000 km from ground zero. (By comparison, the most recent printed map, available from the Planetary Society, which was based on Viking and Mariner data, says Hellas is 5-6 km deep at most.) This is also at least twice the depth as described in Kim Stanley Robinson's Red/Green/Blue Mars trilogy. Assuming as a first approximation that the thickness of the debris falls off linearly with distance (in fact it falls off more steeply than that, parabolically), then the total volume of the ejecta can be approximated by an annular cone 2 km high x 4000 km radius with a hole of 1050 km radius. Vol = (pi* (Ro2 - Ri2) * t)/3 = 32 million km3 (roughly). Now the crater can be approximated by a very low cylinder (think of the proportions of a dime - American ten-cent coin) because the thickness of the ejecta layer which fell back inside the crater is at least as thick as the ejecta layer at the rim. Thus it's volume is Vol = (pi * R2 * h) = 31 million km3(roughly), within 3% of the first figure. Conclusion? It was reasonable for NASA to say that Hellas ejecta from the Hellas Impact is an important component of the overall topography of the Martian Southern Highlands. Scaling from Chixulub crater on Earth (site of the K-T impact which killed off the dinosaurs), and allowing for Mar's shallower gravity well and lighter material, I estimate that the Hellas impactor was at least 140 km in diameter. Ain't physics fun? Return to Mars topo map.